Metro-North assumed operations of Grand Central in New York in 1983 and there was new hope for the old building. The railroad company put in place a methodical program of capital improvements and repairs that included replacing the skylights and to repair the roof that was leaking. In 1988, a master renovation plan was commissioned by the architect firm Beyer Blinder Belle. The same architects who were responsible for the Ellis Island renovation. In 1990, the master plan for Grand Central was presented and adopted at a public hearing. After the hearing an investment of approximately 159 million dollars was made to upgrade utilities, make general improvements and repair structural damage. The main waiting room was restored and in 1992 was formally opened as an exhibition and special events space. In 1994, The Transportation Authority gained control of Grand Central and this enabled them to enter into an agreement GCT, Inc. To implement a major revitalization plan that was based on the previous renovation master plan. Construction started in 1996 with renovating the main concourse and skylight. As the renovation and restoration continued it generated thousands of construction related jobs throughout the state. The project ended with a rededication gala in 1998. The gala garnered both international and national attention. Restored back to the splendour of 1913 marked the beginning of a new chapter for this New York Landmark. Grand Central took shape more than 100 years ago. The current Grand Central building is neither the first railroad station nor the first to claim the name or occupy the location at 42nd and Park. The historic past of the building allows us to gaze back and observe the growth of a lively city reflected in the unrivalled tribute of civic architecture. In 1858, the need for a new train terminal was evident due to a haphazard network of railways plagued by complaints. In 1869, the property was acquired by shipping mogul Cornelius Vanderbilt for construction of a rail yard and train depot. On this site would be the original Grand Central Depot. The depot was designed by the architect, John Snook and opened in 1871. Subsequent expansions and renovations culminated in the1898 expansions of the railway yard under the supervision of architect Bradford Gilbert. Additional interior renovations took place in 1900 directed by Samuel Huckel. Reborn as Grand Central Station, the most prominent feature was the massive train shed. Constructed of steel and glass, the structure rivalled the Eiffel Tower, as the most spectacular engineering accomplishment in the 19th century. The updated structure also featured a classical facade, distinctive ornamentation and a 16,000 square foot waiting room. The age of the locomotive was drawing to an end. Efforts to reduce congestion and increase safety proved insufficient. After a tragic train collision in 1902 plans were announce to improve and expand Grand Central. Plans were in development to demolish the existing building by the end of the year and create a new station for electric trains. The undertaking was expansive and in 1903 a select group of architects were invited to compete for the new terminal and submit designs. In 1904, Warren and Wetmore, and Reed and Stern, agreed to act as associated architects on the project. The next several years were spent revising and amending the plans for the new station. Excavation was a massive undertaking and construction would last ten years. A provisional station at Lexington Avenue was used until 1912. Grand Central opened officially in February of 1913 and over 150,000 people visited the station. Grand Central had arrived and the city would never be the same. Construction of developments around Grand Central began to take off. Buildings such as the Biltmore hotel and the Yale Club were constructed between 1913 and 1917, as well as several office buildings. During the year of 1920 apartments and hotels began construction. Skyscrapers sprang up everywhere, such as the 77 story Chrysler Building. Grand Central prospered, while being the busiest station in the country. In 1947, 65 million individuals or the equivalent of 45 percent of the entire population travelled by train via Grand Central. However, in the early part of 1950, America transformed into a nation of automobiles and suburbs and revenues from rail travel dropped quickly. While at the same time, the value of real estate was rising dramatically. In 1954, plans were commissioned to demolish Grand Central. Nothing would come of this plan. In 1967, the recently established Preservation Commission in response to the demolition designated Grand Central as a landmark, which meant the building was protected by law and later in 1976, the building was designated a historic landmark. Grand Central was spared, but the building was far away from being saved due to decades of postponed maintenance, the structure was disintegrating. In 1983, Metro-North took over. Today, Grand Central is one of Manhattan's most famous landmarks and the heart of New York City. 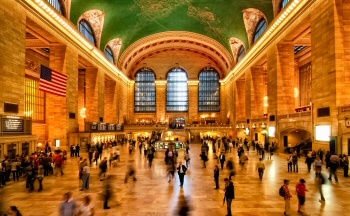 Currently Grand Central has become a midtown destination for gourmet foods, cocktail lounges, international eateries, specialty shops and exquisite restaurants throughout the concourse, in addition to transportation. Grand Central has transformed into a venue for public events and has become an example of a successful project that gave new life to a historic building that would have otherwise been destroyed.